So, I've been on a bit of a butterfly kick lately. Anyway..........today's project is one that I saw part of this project on the blog of a talented demo from Australia, Bronwyn Eastly. 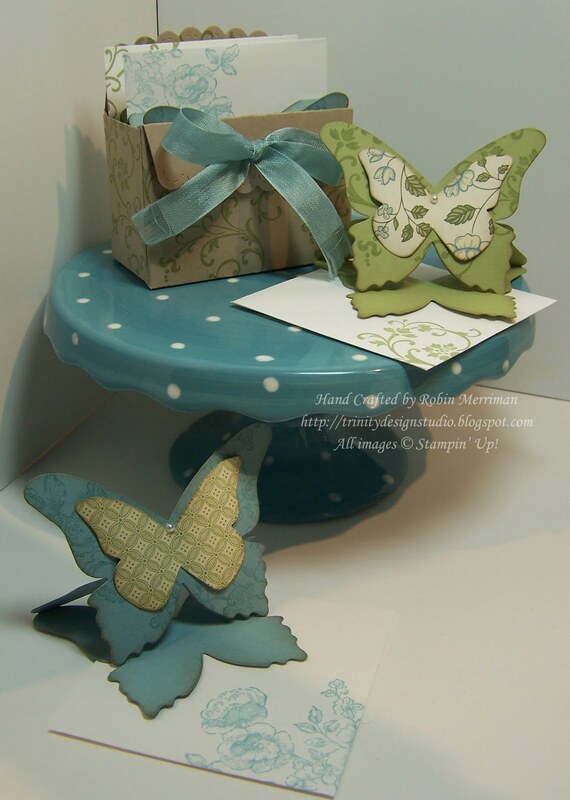 She created these cute little Butterfly Easel cards and as soon as I saw her idea, I knew I had to make my own version! This entire project - including the box I designed for them - was one that we did at my downline team meeting two weeks ago. And for all my stamping clients, you'll be seeing this at an upcoming class as well! 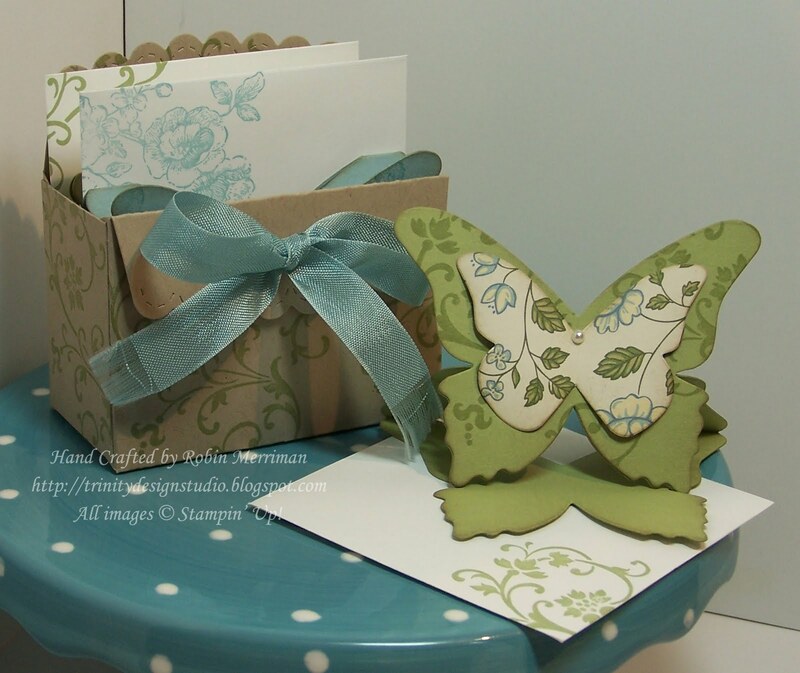 The project included four of the sweet little butterfly easel cards with the coordinating box and envelopes. Just adorable! I used the Springtime Vintage Designer Paper to pull my color palette from - Baja Breeze, Pear Pizzazz, Crumb Cake - Love those colors! And I combined the color palette with one of my all time favorite stamp sets - Elements of Style - that one gets so much use in my studio, I should just leave it out on the counter! My downline loved making these and I know they were anxious to do them with their stampers too! 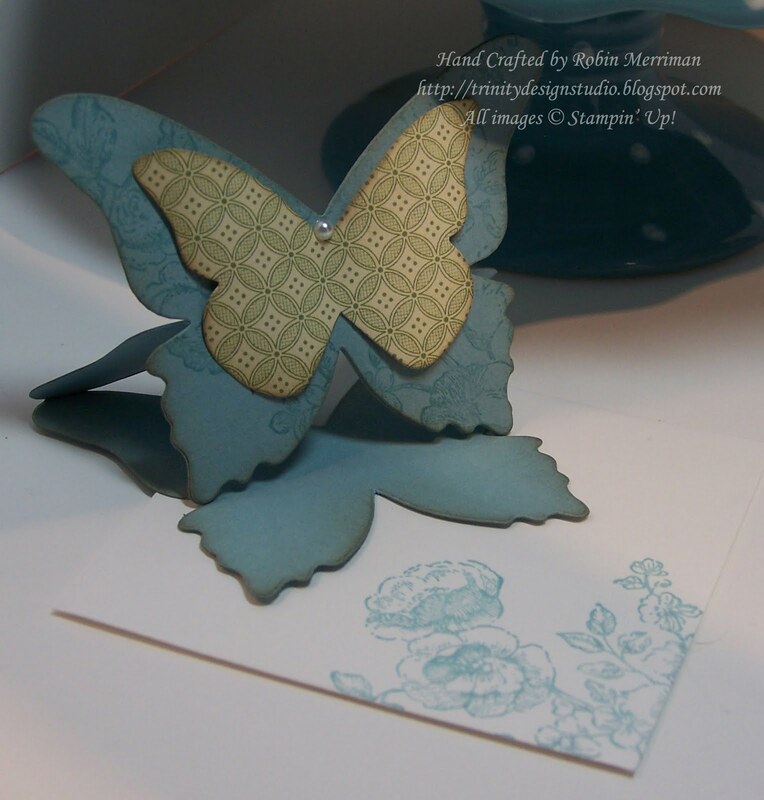 If you are one of my stampers - be watching for class info in April! Spring is on it's way! I'm in love with the BUtterfly Easel...will you be posting a tutorial or some pics of how to put it tog? I have the die...your card and the cute cute box calling my name! Um, yes! They are cool! Hi, I found you from Stampcoasters... how did you make the easel? I have the Big Shot die. I love summer but I abhor my personal summers. I do LOVE this whole set! Beautiful! I love these SO much. Thanks for sharing them with us. As you've seen on my blog I love them!! Well, it's stunning! Do you have a pattern of the butterfly? Found this on Caro's blog this morning and really want to make one for spring cards. I did not see any patterns on your blog though. I saw this on Caro's blog and would love to see a tutorial. I love easel cards and this would be a great addition. Lovely lovely cards Robin and lovely to see you give credit to Bronwyn Eastley who is a superb artist and deserves to get the recognition for this idea as there is a few out there who are not giving her credit.